From Mole Day and Engineering Week at the National Museum for Nuclear Science and History to the New Mexico State Fair, School of Engineering faculty, staff and students bring hands-on engineering to New Mexican children and their families. 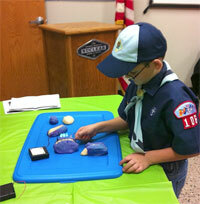 This boy is lighting LEDs with “squishy circuits” made of conductive play dough. 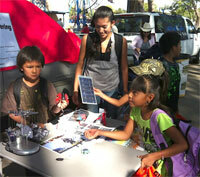 New Mexico State Fair goers play with solar bugs, fans and other devices during Science and Technology Day.